Finally the eternal “Coming Soon” sign no longer graces my home page, my patterns and tutorials pages are back up, and my whole site has a brand spanking new theme. The impetus to finish was, as we like to say around the Tomato Ranch, a deadline with dire consequences. Well, maybe not dire, but still I didn’t want everybody out there in Teevee Land to see my messy mess of a site. I did the entire thing in a fit of inspiration (desperation?) starting at around 2 am this morning and finished in time to go to a friend’s house to watch the show at 10:30 am. 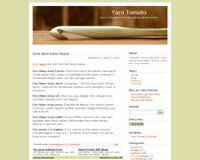 I love my new WordPress theme, which I’m using for my entire site. Once I made the decision to use WordPress to manage the rest of my site in addition to my blog, things went so much more quickly and smoothly! No more tedious picking at individual pages. 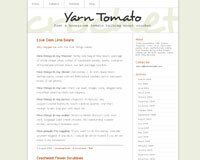 I’ve got two separate installations of WordPress, one for my blog and one for the rest of my site. Now working with my site is a breeze… whee! It looks great over here! It has a calm and relaxed (and put together) feel to it. Congrats on the new do! Donna, the new design is looking good! I was able to get brief glimpses of you on Uncommon Threads as I was getting ready to leave on vacation that Friday morning. Wish I’d been able to sit down and give the show my full attention. But I thought you all did a terrific job!